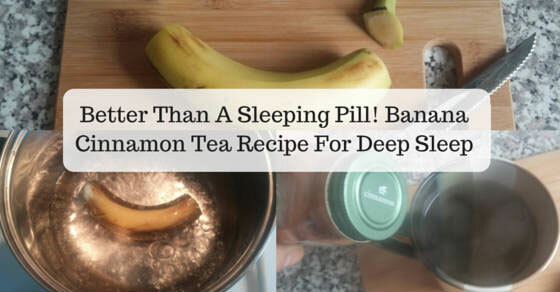 Banana & Cinnamon Tea Recipe for Deep Sleep – Better Than Sleeping Pills! A long rest during the night is very important for anyone that works hard during the day. With the days passing quickly as we chase targets, it becomes almost impossible not to sleep and yet maintain the same levels of competitiveness every single day. As if the body does not understand this simple logic, it is sometimes harder to sleep than to stare the night away with not a wink longer than a second. A lot of people suffer from sleep deprivation, there is hope and it should be shared that the days of lying awake into the early hours of the morning, or even through the entire night are over. A lot of reasons cause people to stay up late into the night, from hard decisions pending processing, troubles making life insurmountable to chemical imbalances simply inhibiting the release of hormones that pull your body towards sleep. Thinking too hard on your problems certainly won’t help if you are serious about getting some restful sleep. While the inability to sleep can be a side effect of some prescribed tablets/pills, usually it is self-inflicted. Playing games on your phone into the late hours of the night can make you lose track of time and before you know it, the sun’s rays creep in on you with eyes wide open at 6 in the morning. It should be noted then that doing away with screens and distractions will better your chances of getting some well-deserved rest when bed time comes. What’s the way forward? How do I force myself to fall asleep? You need to prepare the body for sleep, a ritual of disconnecting from the internet (which by the way never sleeps) and the devices that will otherwise drag you across the hours you should be snoring away. The last hour before going to bed should be left for the body to relax and produce the hormones that cause the state of relaxation to suddenly induce sleep. You can use magnesium rich food to force relaxation and eventual sleep. Luckily we know of an inexpensive food type that contains not only magnesium but also potassium, plus it tastes so good you will probably sleep with the taste still sweet on your tongue. Using banana and cinnamon tea recipe to induce sleep is nothing new and you are better off doing the same thing each night until your body is conditioned to release the sleep hormones without the tea. All you require is some bananas and cinnamon. Snip the ends of a few (2 or 3) bananas off and place the remaining banana into boiling water. Let the active elements of rest infuse the water as it boils for a further 10 minutes. The tea poured into cups and sprinkled with cinnamon will leaving you looking for your bed to enjoy the relaxation it triggers. Both potassium and magnesium are also beneficial in trace amounts for the body to effectively use the nutrients found in food eaten during supper. You don’t have to throw away the banana after drinking the tea, it still has the sweet taste that bananas have and further causes you to sleep into a deep sleep where all your muscles are relaxed and recharged. This remedy to sleeplessness works wonders better than sleeping pills all the time. While sleeping pills are focused on short term conditions that draw their subject to sleep, bananas actually complement their long term approach with being nutritious and filling. If you have ever notices, it is easy to sleep when you are full. Most sleeping pills are mild forms of sedatives, created to reduce the body’s awareness and cloud focus such that the only option is sleep. They result in slower breathing and have active elements that will otherwise cause your body to only sleep when they are taken – addiction. The next time you see a person addicted to a banana come back and let us know. Learning your sleep pattern and optimizing for great resting benefits could be the gateway into a new life that you thought would come with time, only you are responsible for it. The ingredients for the banana and cinnamon tea recipe above are in abundance and common place in your house. Give yourself a break and sleep on the relaxation of banana and cinnamon tea recipe. So, is the banana unpeeled when it goes into the boiling water? And then I can eat the banana after the tea is made? Do not peel the banana during the cooking time, and Yes you can eat the cooked banana.